A new version of Redsn0w jailbreaking tool for iPhone and iPod touch has been released. Redsn0w continue to utilize the similar vulnerabilities which existed since iOS 2.x era, which is based on pwnage2 DFU-mode exploit to inject and run custom code, and it’s not the tool to hacktivate or unlock iPhone. The new version, Redsn0w 0.9.6b1 supports iOS 4.0, iOS 4.1 and probably the upcoming iOS 4.2 running on iPhone 3G and iPod touch 2G. 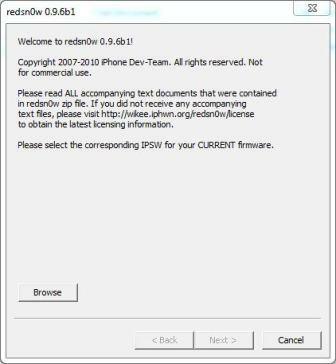 For iPhone 3G users who are unlocking the phone for cross-carriage capability, Redsn0w should not be applied as it updates the phone baseband to the latest version, and possibly make it impossible to unlock the phone. Redsn0w jailbreak will be untethered, which means the iDevice does not need to connect to computer to complete the boot after a reset, with the exception of “MC” model of the iPod touch 2G with iOS 4.1. For this device, it’s recommended to rollback to a firmware supported by jailbreakme.com or spiritjb.com. Note that the download links above may be changed. For latest download links for Redsn0w 0.9.6b1 and future version, visit blog.iphone-dev.org. Note: Redsn0w 0.9.6b1 has been updated to Redsn0w 0.9.6b2, Redsn0w 0.9.6b3, Redsn0w 0.9.6b4, Redsn0w 0.9.6b5, Redsn0w 0.9.6b6 and Redsn0w 0.9.7 Beta 1,2,3. Download the iOS 4.0 or iOS 4.1 for the specific iPhone or iPod touch. Update the iPhone or iPod touch to downloaded firmware (a .ipsw file) via iTunes 10. Download Redsn0w 0.9.6b1 using direct download links above. Click on “Browse” and select iOS firmware 4.1 .ipsw file. Tip: To jailbreak iDevice on iOS 4.2 Beta, also select iOS FW 4.1 .ipsw. Click on “Next” and Redsn0w will patch the kernel and prepare the jailbreak data. Then, select “Install Cydia” and click “Next”. Tip: User who does not require multitasking and Homescreen wallpaper can uncheck the “Enable multitasking and wallpaper” option. 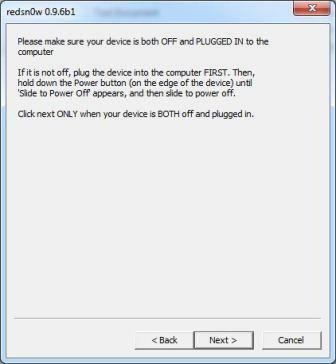 Power off the device and connect (plug in via USB cable) the device to the computer, and then click on “Next” button. Quickly put the iPhone or iPod touch in DFU mode by pressing and holding the “Power” button and then pressing “Home” button simultaneously for about 10 seconds. After a few seconds, release “Power” button but keep holding the “Home” button until installation begins. Wait for Redsn0w to complete the jailbreaking process. 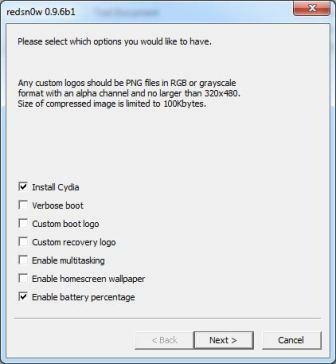 The iPhone 3G or iPod touch 2G will automatically restart when done. Note: Any Windows users seeing “Waiting for reboot” for too long (more than 20 seconds or so), try “shaking” the jailbreak process by unplugging then replugging your USB cable (while letting redsn0w continue to run), or try using a USB port on the computer itself instead of through a USB hub.